Leon Fanniel and Laird Stuart courtesy of San Francisco Theological Seminary. First page of letter of resignation, 1974. Click here  for full letter. RG 414. Friends and colleagues remember Laird Stuart  (1943-12/19/2018) as a consummate pastor with a deep intellect, genuine wit, and faithfulness to God. His passion for the life and health of our church showed itself in his service as a pastor of congregations in New Jersey, Michigan, Pennsylvania, and California; as a trustee of three seminaries (Pittsburgh, San Francisco, and Princeton); as interim President of San Francisco Theological Seminary; and as a board member of the Medical Benevolence Foundation  and the Board of Pensions . Laird ably led the Covenant Network of Presbyterians  as a co-moderator. His open-hearted embrace of the fullness and diversity of Christ’s church led him to develop deep friendships across the theological spectrum. 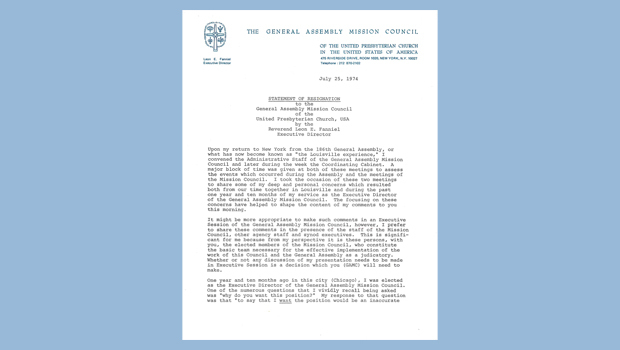 During his many years of ministry, Laird served as a commissioner to four General Assemblies: in 1986 as Vice Moderator of the GA Committee on Mission Design, in 1997 as Chair of the GA Committee on the Book of Order, and in 2002 as a candidate for Moderator. George Abdo remembers that Laird’s “wise voice and good humor” stood out at every turn. 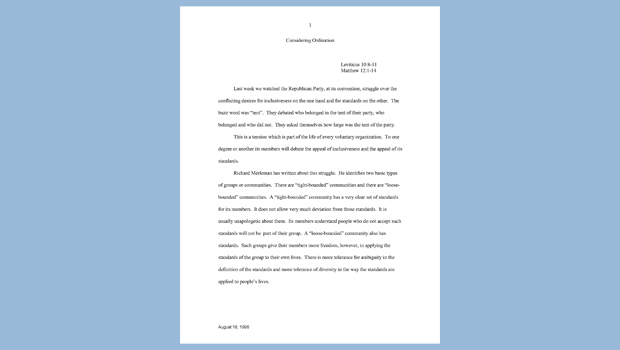 Laird J. Stuart sermon, August 18, 1996. To view Laird J. Stuart's sermons  from 1996-2016, visit the LGBTQIA+ History  Digital Collection in Pearl. We are grateful for the friendship and support both Leon and Laird offered to the Presbyterian Historical Society, and for their donation of personal papers  and an oral history  to our archives. These collections further our ability to preserve and share both their individual and our corporate witness to the grace, truth, and love of God as borne out in the mission and ministry of our church.